A major part of the clinic is community canvassing. A few we spoke to around the neighborhood were aware of the clinics but didn’t know the reasoning behind them, providing a great bridge to talk about police brutality towards individuals of color. Walter Scott and Philando Castile were stopped for having a busted tail lights and ultimately killed by police. One woman in the neighborhood even identified as a democratic socialist, wasn’t aware of the campaign, and took her car over to the clinic and had the light replaced! After, she signed up for volunteer opportunities and made a donation. This community-based approach to solving problems stands defiant against capitalism upheld by car companies and repair shops and fascism inherent in unnecessary police actions. Through our tireless efforts, we can solve community problems and hardships through actions like brake light clinics and prove that socialism will win. The event was first held last year as a project formed by the Direct Service Committee and spread nationwide to other DSA chapters. 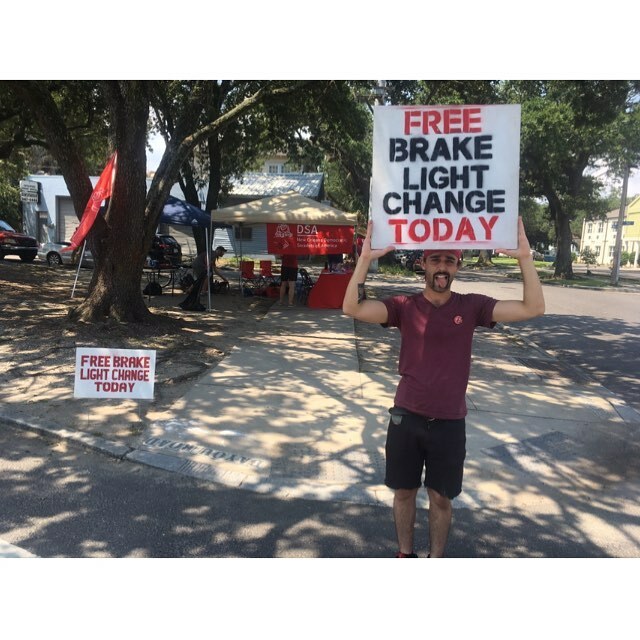 In fact, at least two other chapters in the southeast region held similar brake light clinics that day.